Utility bills are for water and sewer services received in the prior two months and are mailed out bi-monthly. All water service in the District is metered. Water use from 0-600 cubic feet per billing period is covered by the base rate. Average water use over the duration of two months for one person is about 600 cubic feet. If more than 600 cubic feet are used, customers are charged per 100 cubic feet. Water usage typically increases during the summer months. The sewer portion of your bill accounts for the majority of the base rate. Sewer costs to the District are based upon the volume of sewage sent to the City of Bellingham for treatment. All District customers pay the same bi-monthly water and sewer rates. Many district customers, especially those who have just moved to the area, have questions about what makes up the cost of their bi-monthly bill. For more detailed information about how rates are set, please click here. The following applies to calculating water consumption only. Sewer charges are billed at a flat rate of $163.40 regardless of volume. On the left side of your bill, you will see the meter number, followed by meter readings and consumed cubic feet (‘consumed’). If the total amount of water consumed is equal to or less than 600 cubic feet, your water consumption is included in the base rate for service. Refer to the rate table above for our current rates for service. Subtract 600 from the total amount of water consumed. This is included in your base rate. Multiply the remainder by 0.0998. This is your consumption charge. This amount is in addition to the basic rate for service. Adam used 950 cubic feet of water. 600 cubic feet are included in his base charge of $70.31. 350 cubic feet are billed at the consumption rate of $9.98 per 100 cubic feet for a total of $34.93 (350 x $0.096). Subtract 2500 from the total amount of water consumed. The first 600 cubic feet are included in your base rate. Usage from 601-2500 cubic feet of your total consumption will be billed at the second tier rate of 0.0998/cubic foot, which is $189.62. Multiply the remainder by 0.1248. This is your consumption charge. This amount is in addition to the basic rate for service. Mary used 3200 cubic feet of water. 600 cubic feet are included in her base charge of $70.31. 1900 cubic feet are billed at the consumption rate for 600-2500 cubic feet, which is $189.62 (1900 x $0.0998). The remaining 700 cubic feet are billed at $12.48 per 100 cubic feet, for a total of $87.36 (700 x $0.1248). A Utility Local Improvement District (ULID) is the procedure used to extend service to a group of properties whereby all property owners share in the cost. This process is a formal State defined procedure covered under the Revised Code of Washington (RCW 36.94.230). Property owners in the benefit area may pay the assessments in a single lump sum or pay in installments over a period of time. 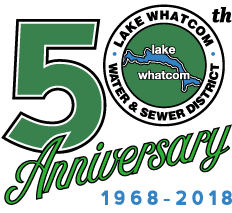 In 2001, the Lake Whatcom Water and Sewer District Board of Commissioners formed ULID #18 for the financing of the Lake Louise Road Sewer Interceptor. Some vacant properties located within the benefit area were excluded from the assessment role because the property owner elected to “opt out” of ULID #18 by recording a Restrictive Covenant. A Restrictive Covenant prevents the property from receiving sewer service for a period of at least 25 years from December 16, 2002. The original amount for ULID #18 was $2,792.78 per assessment. ULID statements are billed annually on March 1st to the owners of assessed lots carrying an open assessment balance. Charges for water and sewer service, if the lot is connected to the water and/or sewer system, are billed separately. ULID charges are billed at $139.64 principal and 9.5% interest on the remaining unpaid balance on the assessment. The due date for the minimum annual payment is April 30th of the year it is billed. A 30-day grace period is allowed. If the minimum annual amount due is not paid by the due date, including the grace period, a past due fee of 12% will be assessed against the annual minimum amount due. For more information about ULID #18, please contact the District Office. In 2014, the Board of Commissioners passed Resolution 807, Establishing Policies for the Administration of the Newly Adopted Low-Income Senior/Disabled Reduced Rate Effective January 1, 2015. The District offers reduced rates to qualified low-income senior and disabled customers for water and sewer utilities provided by the District. In order to qualify for these rates, the property owner must provide written documentation from the Whatcom County Assessor’s Office demonstrating that the applicant is currently approved for a property tax exemption under the “Property tax exemption program for senior citizens and disabled persons.” For further qualifications, or to apply for reduced rates, please see the below application.